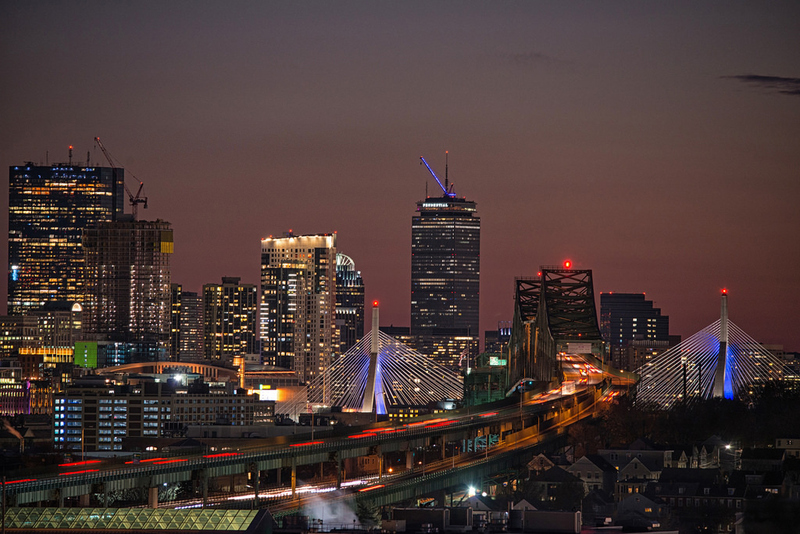 Acraftymitch captured the Tobin and Zakim bridges and downtown Boston from Malone Park in Chelsea this evening. Copyright Acraftymitch. Posted in the Universal Hub pool on Flickr. That's a long way from the Zakim Bridge! I would love to hear about the photographer's equipment. I will give the photographer credit for getting a good night shot with some decent light streams etc but distance wise this is an easy shot. I would say they were using a 200MM lens max for this shot. My 300 MM from that exact spot (Yes exact spot, there is a bare piece of dirt where this was taken, right behind a tree in the park, it is a very well used spot for this scene) can pull out the prices of the tolls on the Tobin Bridge and the license plates of cars going by. The link I attached below was about 200MM on a cropped sensor long exposure later in the evening (so much less light) , not my best work but the only one from that angle that I have posted anywhere I can link to at the moment. Looking at his other shots though , I am impressed with his ability to work with light and operate in low light settings. He has some really great moon city shots in his series and other great light trails in the city as well. Acraftymitch here - Thanks for the feedback. I was at 300mm for this shot (using a sigma 150-500). I would have done longer exposures, but with the wind, anything over 1.3 seconds was not in focus. That is also a very windy spot so I am not shocked by that... Not every night shot needs the light streaks though. I like how soft this image feels, it would have looked "harder" if you went over a second exposure, the sky would be different etc. I think it worked. Nice thing about Flickr is that it lists basics of setup.